As Michael Palin’s Ripping Yarn “Tomkinson School Days” begins, “training for the hop was a nightmare”, and sitting having a look at the roster of games, as well as plotting routes between the venues, the idea of six games in 41 hours including four games in a day was simply terrifying! I love my football, and while I had done three games in a day twice, four seemed daunting. Following last year’s hop which was weather hampered and reduced to four jousts, with just three on the Saturday, good sense prevailed in delaying this seasons diet by two weeks. It certainly worked out well as had they plumped for the same weekend again, it would have seen a highly likely total wipe out of the entire card as that mid March weekend saw torrential downpours, and only one East of Scotland league fixture survived at St Andrews. 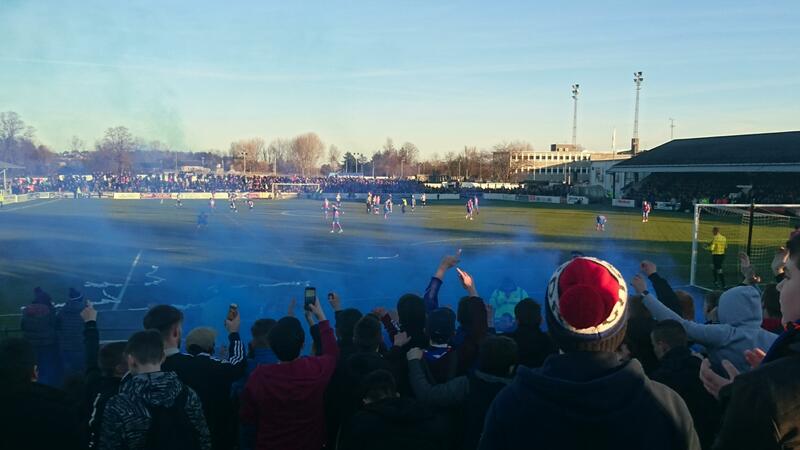 Since last season the sixth tier of Scottish football has seen a remarkable change of scene. As Tracy Chapman once sang, “we are talking about revolution”, with 26 East Junior sides following Kelty Hearts and jumping across to the senior game. Obviously it wasn’t possible to have one league with thirty nine clubs (although Argentina would give it a real go!! ), so they were spread across three leagues (conferences) with the winners playing off for overall Champions and one promotion spot in the Lowland League, the southern half of Scotland’s fifth tier. The losing two winners as well as the remainder of the top five in each conference are guaranteed to form a new sixth tier, a sixteen team “super league” along with some 6th placed teams depending on who gets relegated from the Lowland league. The hop brought together a veritable potpourri of the new members and the long established East of Scotland gang for our entertainment. It was a journey that took me to some places in my own country that I have never been, so it was considered a useful exercise. It is maybe just a personal preference, but having only ever watched three “Junior” games in my life, the switching of these 26 clubs was akin to adding extra colour to my “Senior” world! Little by little I have been ticking them off for a first peek, but the hop was bringing a torrent of new grounds for me with five of the six getting an inaugural visit. It all kicked off in Denny, a small town just west of Falkirk and home to Dunipace. Westfield Park is a new facility for the club and community, a basic place, and one of those 3G pitches to allow multi use, but frowned on by many a seasoned hopper! Dunipace were never a top Junior side, and that form has transferred across to the new league, but the essence of the clubs ambition will see them improve in time. For this 8pm Friday night fixture under the lights, Dunipace were hosting the Manchester City of the East Juniors of old, and continuing in similar fashion this term in the shape of Bonnyrigg Rose, who just needed a point to sew up their conference. Dunipace set about the task of frustrating Rose by applying that old Bob Crampsey adage, “it’s never easy beating strategically placed dustbins”, which is maybe a slightly harsh analysis of the home sides blanket defending as they did put a lot of effort into stifling the opposition. That said, Bonnyrigg almost knew the breakthrough would come and they rarely broke sweat, or got out of second gear. However, at 1-0, any team will have a chance and Dunipace perhaps should have levelled from a rare corner, but the big defender headed over. Towards the end, with legs tiring, Bonnyrigg found the net a further three times, one an audacious “Panenka-esque” chip into the centre of the goal from a spot kick. In winning 4-0 and indeed clinching the Conference, Bonnyrigg players showed little joy or emotion, the job is only half done, and two crucial matches in a few weeks against the likely opponents of Penicuik Athletic and Broxburn Athletic for the title and promotion will be the real barometer of success. Bonnyrigg are rightly an ambitious club. Saturday mornings 11am kick off at Camelon saw me exit the motorway at the same junction as the night before, merely turning left instead of right, heading towards Falkirk, of which Camelon is a suburb. Carmuirs Park is a proper old fashioned football stadium, with the pavilion/changing rooms immediately reminding me of Kilbowie, once the home of Clydebank. The ground has seen better days with the terracing crumbling and off limits behind one goal, but it has charm and I am sure most of us like a stadium with a bit of character. In a garden behind one goal was a cleverly built little viewing box, complete with roof, on legs just high enough to see all the action, and sure enough, right on kick off a capacity crowd of two fitted into the box for watching the game for free!! Edinburgh United were in town, the fourth Junior “jumper” of the hop thus far, and like Dunipace, not from the top echelon. I had seen Edinburgh United twice already this season, shipping eight and four goals respectively, and in fielding a young team in this encounter, defeat was always likely, but to be fair to them, in losing 5-1 they did contribute to the spectacle with some attacking prowess, unlike Dunipace! Camelon were too good on the day and are comfortably in the top five in their conference to bring “Super” league East football, and the big boys of the old Junior days back good Carsmuirs. Camelon have a Junior Cup win on their roll of honour, and I am sure they will be aiming higher. It was a good crowd for such an early start too, but some of the “hoppers” rebelled and went off to watch other afternoon games, believing that the next venue constituted a lowering of standards! Inverkeithing was the 2,15 pm start, a whizz back along the M9 and across the new Queensferry Crossing over the Firth of Forth. Inverkeithing is very close to the Fife side of the bridge, and indeed, down by the playing field you are right beside an inlet of the Firth, and from the far side of the pitch you can see the top of all three bridges that cross the Firth, affording a spectacular backdrop. Granted that the Ballast Bank ground is extremely basic with nothing more than a perimeter fence to lean against and portable dugouts, but these are fledgling days for the Swifts who have togged up from merely being a club for kids, to adding an adult wing. They had a terrible start to the season, but gradually they’ve won a few points. This game saw the first sighting of an old guard East of Scotland team in the shape of Heriot Watt University. They were the only alternative last year for the 5,15 pm game last year, and while I am sure some must have hated not only the artificial surface, but the fact it was an indoor game, the 2-2 draw with Leith Athletic was the pick of the games from the 2018 edition, with the last goal from Leith being my goal of the season! Heriot Watt must feel a little peeved as they are the lowest of the three Uni sides involved in the senior set up, but they needn’t fret unduly as I suspect the other duo will soon drift downwards as the Lowland gets choke full of highly ambitious ex-Junior sides! This game was to ebb and flow, but Inverkeithing gifted HWU the first two goals before knuckling down and making a real old fist of it, with ten men too, and even with nine, however at 2-4 and down to eight, the game was up!! I suspect that the referee would have been hunted out of town pretty quickly afterwards, but he got the decisions pretty spot on in my opinion! Inverkeithing Hillfield Swifts can though claim the longest name in Scottish senior football now, nicking that title off my mob, ICT! It was back in the car, across the bridge and along the M8 in a westerly direction this time headed to Blackburn! I have to confess that I didn’t realise such a place existed before this season, and even when you are off the M8, thank goodness for Sat-Nav as the name Blackburn only seems to appear on a sign at the roundabout just outside the town limits! New Murrayfield is the name of the home to Blackburn United, and a tidy community set up they have here too. Being the tea-time kick off, the food was flying off the shelf, and the inventive option of a curry was all gone before kick off! Some of the “rogue” hoppers had returned as alternative early evening kick offs were non-existent, but another plastic pitch would have seen them muttering in their bovril! That said, give me a true artificial surface like this over the dry and bumpy pitch at Camelon, or the excessively long grass of the Sunday game, which we will get too eventually!! A morsel of pithy wit had given our English guests a Lancashire derby in name at any rate, with Blackburn v Preston! Albeit it is Preston Athletic from Prestonpans on the coast in East Lothian. Preston have been serially involved in the last four hops!! The first attempt was cancelled due to a waterlogged pitch, which resulted in a call being made to Edinburgh and Civil Service Strollers to tip them off about the unplanned arrival of the hoppers. They just had enough time to get along to the local supermarket to hoover up as many pies as they could get! In recompense for the cancellation, the next year the hop started in Prestonpans, and last year they were the visitors to Burntisland, and here they were again popping up in Blackburn. Preston did start life in the inaugural Lowland League, and they have the unenviable claim to have been the first club relegated from the new league. Given the explosion of new clubs at this level, they will struggle to find a way back to the Lowland, but they are the closest of the original East teams to clinching a top 5 finish, but defeat here at Blackburn might have put pay to such an outcome. Blackburn had been thrashed 7-0 at home by Linlithgow the following week, but they knuckled down here and put in a good shift winning 4-1, a scoreline that slightly flattered as Preston had good spells in the game too. Each game had served up a hat full of goals, the trio of Saturday games had brought 17 thus far, 21 if you include Dunipace the night before, but I was now in unchartered territory, a fourth game in the day. This was the tightest turnaround from a 19,10 finish to an 20,00 ko, but with only 11 miles to travel to Linlithgow, it was easily achieved. Linlithgow Rose are one of the big Junior clubs from the East to have jumped across and the 3,500 capacity Prestonfield stadium is a fabulously well kept venue. I had been here a few times, seeing them beat Fraserburgh and Wick in the Scottish Cup, as well as one of those three Junior games, the fabled derby with Bo’ness, which resulted in an easy 0,3 away win that day in front of a big crowd. Rose have not been without issues this term, and it seems that they won’t make the Conference promotion play offs as Broxburn Athletic might just have kept their nerve enough to win this particular section. However, Bo’ness have failed to make the play offs too, so they can look forward to re-establishing that classic derby fixture next season as they have been in different conferences this term. This evening kick off was not only the highest attended of the six game at 580 (some counted 620), complete with a good number of fans down from Perth to see their beloved Jeanfield Swifts (a club record away following apparently! ), but it would become the game of the hop. All four Saturday game had been played at a good tempo, and chances fell for all teams, but my goodness, this was the fastest paced game, and while Linlithgow were to edge it 3-2, no one could have denied the Swifts a draw, or even a win, as they were very impressive and dangerous on the break. Saturday’s football was over, I had not only survived, but enjoyed each and every game. The goals tally for the day closed at 22, not a bad return for £23 entry to all four games! Where else could any given Saturday serve up two Swifts, and including Friday night provide two Roses as well! It was back along the M9 to Edinburgh for the nights kip, foreshortened by the clocks going forward, ahead of the final piece of the hop action in the Scottish Borders. Peebles Rovers were similar to Preston Athletic in having suffered a postponement for the Sunday game last season due to overnight snow! I know they had produced a lavish programme for the visit of Ormiston on that occasion, and doubtlessly forked out a lot for catering, so in the rescheduling on the roster for this season I hope it brought them some financial compensation. That said, judging by a souvenir programme (complete with biggest ticket I have ever seen!) on the spartan stall of Peebles goodies, Celtic had sent an XI at the start of the season and I would hope a good crowd came out for that one! If Brendan Rodgers had been at the game, given his constant whining about the length of the grass at Tynecastle every time he went there, he wouldn’t have liked the length of the blades on the lumpy surface at Whitestone Park. It is a lovely setting for a ground with the rolling Borders hills providing a stunning backdrop, and unlike everywhere we visited except Linlithgow it does have a stand, but judging by pitchside mutterings, a stand in a park doesn’t constitute a ground, and whoever that was decided to stay in the pub to watch some match between two Glasgow clubs?! Nope, can’t think who!! I had never seen Peebles play until five days earlier when I was at the new Leadburn derby, (way better than anything Glasgow can offer!) Penicuik Athletic v Peebles Rovers! Penicuik are one of the Conference winners and they are a slick, fast paced team, who will cause Bonnyrigg problems in the promotion play offs. Peebles by contrast are one of the “middle table” old East of Scotland sides, muddling through a tough campaign against more ambitious teams relatively well. Once everyone finds their level next season it will all settle down. At Penicuik they heroically only lost 3-0, playing the last thirty minutes with just nine men and not conceding again, but exactly how remains a mystery! Newtongrange Star, another “bigger” club were in town for the last game of the hop, and maybe I was beginning to feel punch drunk, or the pitch wasn’t helping either team play cohesive football, or we’d found ourselves a piece of fence beside “hoppers” who hardly had a good thing to say about anything , but it dragged! Nittin as Newtongrange are called were always likely to win, and they did 3-1 bagging a penalty amongst the goals to make sure every game had a converted spot kick and nicely bringing the entire hop half dozen games tally to a neat 30 goals. Rumours suggest that the six games were just 20 people short of the hop record for Scotland, but the many visitors by car and bus had undoubtedly swollen the gates at five of the six venues to potentially season highs, and while it was a few short of the biggest crowd of the season at Linlithgow, it would have been one of their bigger gates too. Last season I mulled the motivation of a far travelled hopper. Many a camera was about, little notebooks to keep the teams and substitutions etc, could be spotted, I get that. A prerequisite of a chosen venue for the hop is for a programme to be produced, which I am sure adds an extra few pounds to the coffers if they sell enough, and I must confess I do like a programme from games I attend, but don’t go all sniffy just because it isn’t a thing of beauty! These are small, and wonderful clubs that add real colour and tapestry to the Scottish game. Poor old Peebles Rovers have a collapsible perimeter fence on one side because the cricket club use part of their ground for the outfield in summer! And when they asked to put down an artificial surface the locals in their mansion houses up the hill on the road objected!! They have enough “local” issues without visitors losing all sense of perspective and looking down their noses at them. The good people of Peebles don’t care about the pontifications of who referees in the Glasgow Universities league, or what the ramifications of a car crash of big English clubs in League One next season might mean in preventing Ipswich getting an easy rise back up!! As money is ruining the top end of the game in every country, be thankful for these fabulous teams, whose every effort to make to ends meet and continue playing each and every season is a marvel in itself. Turn off the TV and go and support your local team, it’s the only way! !